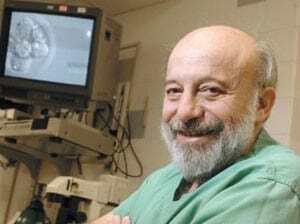 For three decades, Dr. Sherman Silber has been treating difficult cases at The Infertility Center of St. Louis on the campus of St. Luke’s Hospital in Chesterfield. A Columbia, Ill., woman is the first cancer survivor in the United States to give birth to a baby as a result of ovary freezing and transplantation, thanks to fertility preservation procedures performed at St. Luke’s Hospital in Chesterfield. Thirteen years ago, when Amy Tucker, then 19, was diagnosed with Hodgkin’s lymphoma. She thought the chemotherapy and radiation would rob her of ever having children. But then one of her doctors told her about Dr. Sherman Silber, a pioneer in fertility preservation and director of the Infertility Center of St. Louis at St. Luke’s Hospital. Silber removed one of Tucker’s ovaries and froze it. In January 2009, Tucker returned to Silber so he could transplant her ovarian tissue [watch news video] that had been frozen more than a decade earlier. And on May 27, Tucker, 31, gave birth to a baby boy[watch news video], Grant Patrick Tucker. Though the first cancer survivor in the U.S. to give birth as a result of these fertility preservation procedures, Tucker is one of a couple dozen women worldwide who have chosen ovary freezing to protect them from the sterilizing effects of cancer treatment. One in every 250 young women today is a cancer survivor, but their cancer treatment usually leaves them sterile.